Our always popular flagship location. Discount on-site lodging available for this class*. Learn to frame like a pro, no experience required. 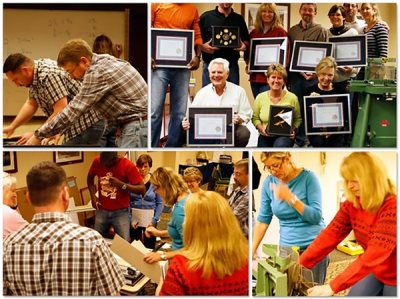 This 1-1/2 day class (April 12-13) covers the technical basics, including mat cutting, mounting, cutting and joining frames, glass cutting, fitting, frame design and selection, equipment buying advice, and more. Once you’ve successfully completed the Basic Pro Class, you’re eligible to enroll in the (April 13-14) APFA Advanced Class. Or, take ’em together with our Boot Camp Option and save. BOOT CAMP SAVINGS – Only $1395 – You Save More Than $700. Bring a friend – Additional Students Only $995. Our only Northeast Class. Almost full, enroll today. Our most popular option (April 12-14), the 3-day, 6-session Boot Camp combo includes both the Basic and Advanced Classes for maximum learning and maximum value. Boot Camp students earn their APFA Certificate and also receive the Easy-Quote Pricing System at no additional charge. Enjoy Spring in New England, Bring Your Camera. Our Flagship Location — the APFA began here, conducting its very first class in 1999. Southington, CT is a charming and picturesque New England town, surrounded by mountains, and located just a short distance from the sprawling ESPN studios, and Lake Compounce – the oldest amusement park in the U.S.. Our Southington classes are always special, and because they are strictly limited to only 12 students, they are usually full. Early enrollment is highly recommended.